The Zenit Fotosnaiper was a Soviet answer to the problems of camera shake using long lenses. In the West, it was known as the Photosniper, and it’s not hard to see why. 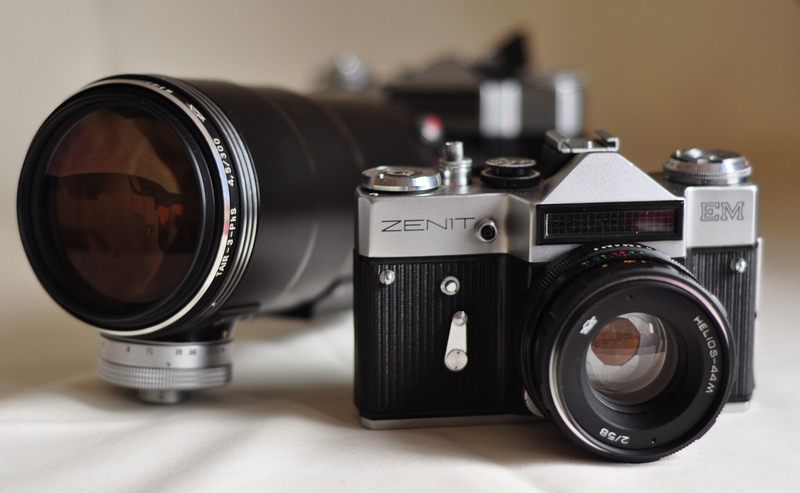 The Fotosnaiper paired a Zenit SLR body with a 300mm lens – and added a stock grip and trigger. 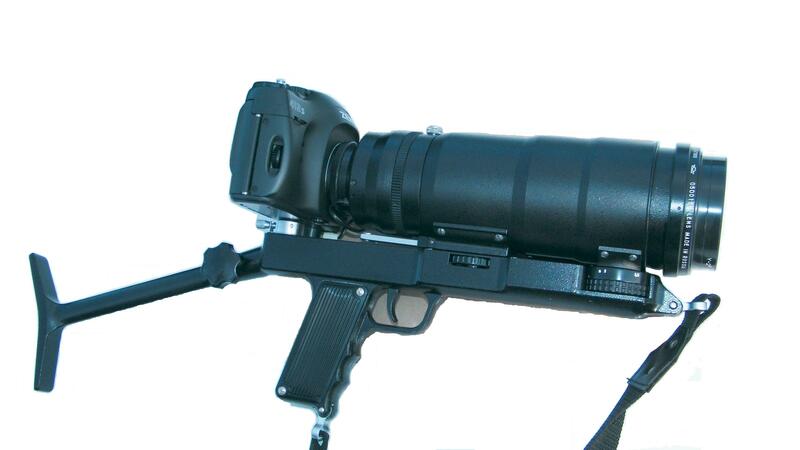 The Fotosnaiper looks like a cross between a Zenit and an AK-47. And there’s a good reason for this – the Fotosnaiper was designed to be used on the battlefield. The first Fotosnaipers were designed in the 1940s, when the Soviet Union was at war with Germany. Many of the Red Army’s soldiers would have had little experience with the USSR’s various Leica clones, so designers at the Soviet camera-maker VOOM-GOI built a rifle-like system that mirrored the kind of firearms the makhra (infantrymen) would take into battle. On it was added a modified FED 1 rangefinder with a 135mm lens. Pulling the trigger took the shot. The VOOMP FS-2 came with a an SLR-style prism – much easier to focus with than the FED’s finicky rangefinder. Several hundred of this early Fotosnaiper model were made. The cameras had to be modified so that the shutter could be fired by squeezing the trigger; Fotosnaiper-ready cameras had a hole bored into the baseplate to allow this. A dial on the underneath of the lens allowed the photographer to focus. That way, they could focus with one hand and press the trigger with the other. It’s said that the Fotosnaiper cams back into vogue after Soviet premier Nikita Khrushchev broke his old FS-3 and wanted a replacement. The chiefs at KMZ, the makers of the Zenit and Zorki camera lines, decided that this was reason enough to build a new Fotosnaiper. Most of the Fotosnaipers you see today – and kits regularly pop up at camera fairs or on eBay – come from the 1960s or later. In 1965, KMZ used a specially modified version of their M42-mount Zenit E SLR, known as the Zenit ES, with a special shutter attachment on the bottom so the camera’s shutter could be tripped by the trigger. The lens was a mammoth Tair 300/4.5 telephoto lens, which is focused by a dial on the underside of the stock; there’s another dial which allows you to set the aperture. The lens also comes with a tripod mount that allows it to be mounted to a normal tripod. This model is known as the FS-3. The 60s-era Fotsnaiper came in a large metal case, complete with the Zenit’s standard Helios-55 58/2 lens, five filters for the Tair, a reloadable film cassette and sunshade, and a set of screwdrivers, all of them firmly attached to the top of the case. The robust case hinted that the new Fotosnaiper still might have been intended for military use. What might seem a highly specialised piece of photographic kit was, somewhat surprisingly, built in large numbers. According to Jean Loup Princelle’s ‘Authentic Guide to Soviet and Russian Cameras’, almost 100,000 were made. In 1982, a new version of the Fotosnaiper was unveiled, this time sporting a Zenit 12 SLR, an updated version of the E that replaced its uncoupled selenium meter with a battery-driven CDS meter. This, the FS-12, was built in ever bigger numbers – some 112,000 of them rolled off the KMZ productions lines. There was time for another modification before the Fotosnaiper story ended. The Zenit 12 was replaced with the Zenit 122 SLR (the latest in a long line of Zenit E clones) to create the FS-122. This was made as late as 1995. There were a number of prototype models too, matching the Fotosnaiper stock to cameras such as the semi-automatic Zenit 16 and the Zenit 19, but the Fotosnaiper has, essentially, not survived the Cold War (only one Western company, Novoflex, built a similar system). 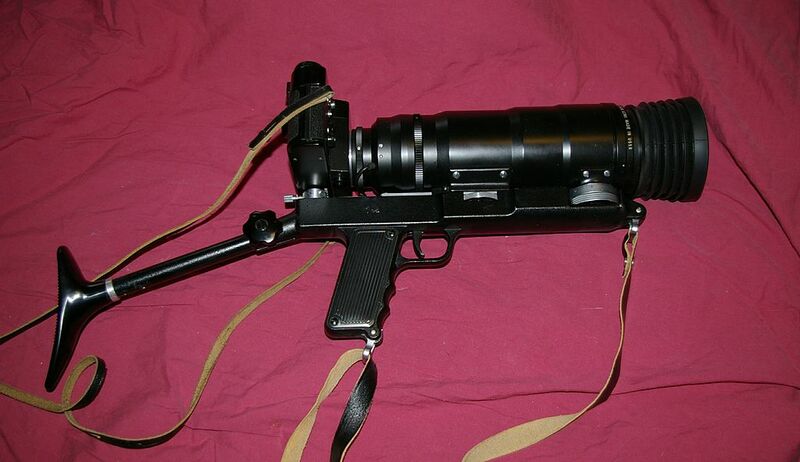 There was a widely spread myth that the Fotosnaiper had been designed by the KGB to be used as a spy camera, though this didn’t stand up to much examination – there can’t be many camera outfits that are as noticeable as the Fotosnaiper. Thanks to the fact some hundreds of thousands of Fotosnaipers were made, the outfit is reasonably common, especially the later models built around the Zenit 12 and 122. Outfits have sold recently on eBay for as little as £85 (around $100) which is not a lot of money for a highly specialised piece of photographic kit with some added Cold War curiosity. The main problem with the Fotosnaiper? You’re unlikely to make many friends – especially with security forces – by lugging around a camera outfit that looks like a grenade launcher.